AEC 2018 returns to the national and international stage. 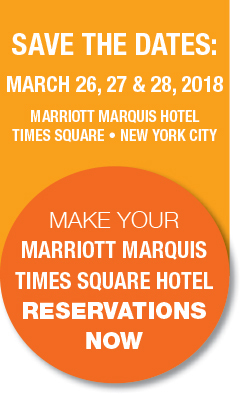 The 10th Conference in New York State's Advanced Energy Series will once again be held in New York City - this time on Broadway's Great White Way in Times Square at the beautiful Marriott Marquis. Hotel reservation deadline EXTENDED – reservations must be made before midnight, March 16, 2018. Plan now to be part of this exceptional Conference, as an attendee, sponsor or exhibitor. YES! I'd like to receive up to date information about AEC 2018 as it becomes available. I understand my information will not be used for any other purpose than for the Conference and not sold to third parties.